August 30, 2017 - Like us now! You’ve landed on a great idea. Brilliant. You’ve turned that idea into a product. Even better. But what do you do now? How do you find the right consumers for your product, the right people to become your business partners, and the right investors to fund your efforts? The answer is ‘Pitch Deck’. Pitch Deck is simply a presentation made on PowerPoint, Prezi or similar tools. It is used by startups, in online or in-person meetings, to give a quick overview of their business plan. Pitch Decks are extremely important to attract the right people to your startup. 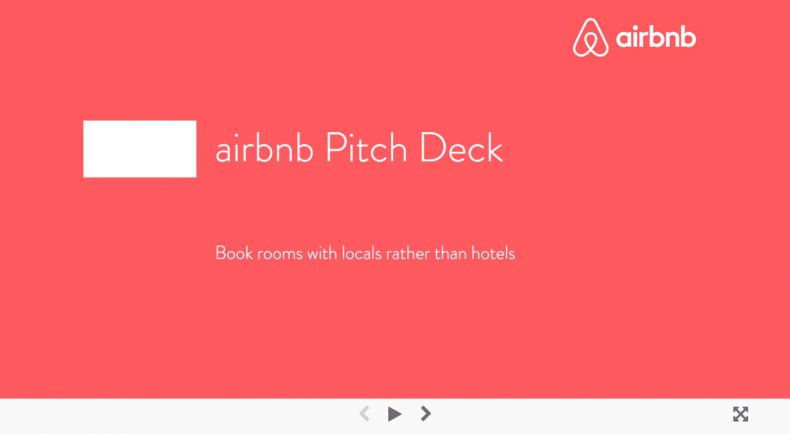 For all the budding or struggling startup founders, we’ve compiled a list of the most impressive Pitch Decks of the world’s most renowned companies. All these companies started out from a very small scale but now have an estimated net worth in billions of dollars. Go through their Pitch Deck and note what makes them stand out from the crowd. The ride-hailing startup that shook the world started from humble beginnings. Below you’ll find a pitch deck they used for their seed funding round in 2008, a year before officially launching the startup. The business model the co-founders shared in this pitch deck vowed to rake in $20 million to $1 billion a year in revenue but the company has long since diverted from that model. Also note how the pitch deck includes various use cases that Uber did not launch until several years later or completely left them. This is the pitch deck LinkedIn used for its Series B funding round way back in 2004. The presentation is 37 slides long. Investors don’t have the patience to sit through such a long presentation. But note how LinkedIn’s pitch deck is low on text and high on statistics and graphs. This is an effective way to make the mark. To understand more, go through Reid Hoffman’s narrative on this pitch deck and his advice to young entrepreneurs. BuzzFeed is the most renowned media website in the world right now and they knew what they were doing because they’ve shown off impressive website stats and figures in their pitch deck. The company has been able to raise over $240 million to-date. 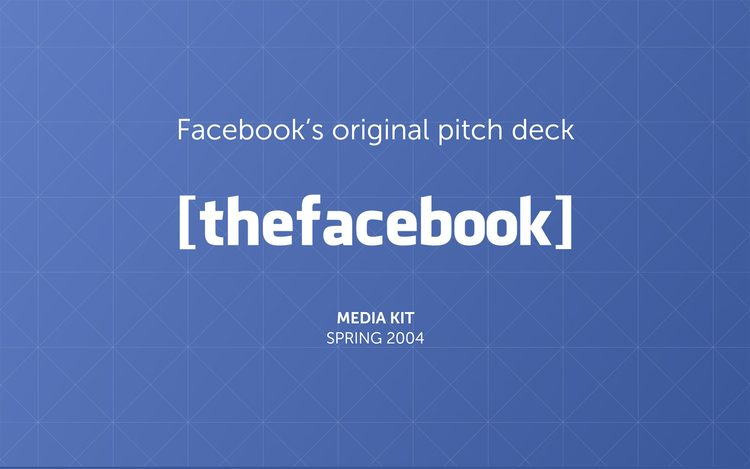 Facebook does not have a public pitch deck but it does have a media kit they used back when it was known as ‘The Facebook’. Their first investor was Peter Thiel, from whom it raised $500,000. 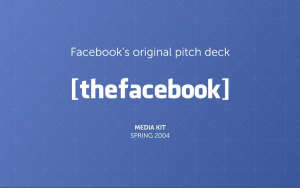 ‘The Facebook’ media kit includes the company’s value proposition, key metrics, and marketing tactics that were used to sell ads to potential clients. Foursquare is an app, launched back in 2009, that helps people find the perfect hangout spot. Their pitch deck from the 2009 seed funding round is very text heavy but note how it uses screenshots from the functioning app as proof. Lesson here: always know how to back your claims. Tinder’s public pitch deck is from a time unknown when it went by the name Matchbox and had the cringeworthy tagline of ‘The Flirting Game’. But aside from that, this is a great presentation. It’s short and to the point. Moreover, note how they’ve build a story on a use case of a guy who spots the perfect girl but can’t go talk to her. They’ve also thrown in its buzzwords about how the app works and sources of revenue as well so that it sounds like they know what they’re doing. YouTube used to have a public pitch deck which they used for pitching to Sequoia Capital and ended up raising $3.5 million in a Series A funding round. But that presentation has been taken down now. It clearly explained what the product did and how YouTube aimed to become the leading website for video content. Investors love confidence and that is exactly what that Pitch Deck had. That presentation may be gone, but we did get our hands on an investment memo that Roelof Botha from Sequoia wrote in 2005 urging the investment committee to invest in YouTube. YouTube went on to get acquired by Google in 2006 in a deal worth $1.65 billion. Airbnb has become the ultimate platform in the western world for leasing or renting short-term lodging. The best takeaway from their pitch deck, other than the simple aesthetic and usage of figures, is their tagline – ‘Book rooms with locals, rather than hotels’. It may be very simple but it gets the message across and interests people to raise questions. That is exactly what you want to do – get people talking. 5 things all successful people do before 9 A.M.